There is little doubt that golf can be a frustrating game at times. Hours of practice and money spent on tuition may still leave some players a little hot under the collar if things are just not going right. Of course, it may simply not be your day; on the other hand it may be that technique is not falling in to place as quickly as you thought or desired. One of the most frustrating parts of the game to master is the use of the long irons. It may be you are not achieving the desired length or the amount of loft, or both. 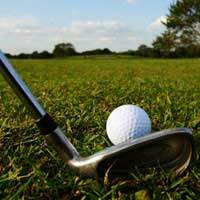 Sometimes, it's only the thought of incurring the wrath of fellow players or the club president that prevents you from sinking the club head into the fairway in sheer frustration. What, you mean you never felt like that? Pull the other one. But what if there were an alternative to the long irons? An option that made life on the course that little bit easier? And all within the laws of the game, naturally? Step forward the hybrid club, the saving grace of many a frustrated long-iron player. The mission of the hybrid club is to provide more loft and more yardage with less effort by combining the qualities of both a wood and an iron. It is more forgiving of shortcomings in technique, and its more lightweight and shorter shaft makes it easier to handle, both on the fairway and in the rough. It won't come as any surprise to learn that in certain circles there is a certain snobbery attached to the use of these clubs. Some players feel that it is an admission of failure, that you're just not cut out to master the finer points of club use, or worse a quitter who is simply looking for the easy way out. But it should be remembered that a number of professionals have quite happily turned to a hybrid club during tournament golf. As already stated, they are within the laws of the game and exist not as a get out clause but as a valuable tool available to a player whatever the level of their ability. As such, they are sometimes referred to as a utility club, even a rescue club but most people tend to resist using the latter term precisely because it only invites the sneering that accompanies unfortunate outbreaks of snobbery on the course. Such is the popularity of hybrid clubs that a number of manufacturers now offer them in sets. There's certainly no sense here of them being some under-the-counter product that can only be secured with a nod and a wink to the local retailer. They can also be very useful in the education of younger players who may not be physically ready for the demands of wielding a long iron. The bottom line is that whether it is physical or technical reasons behind your decision to embrace hybrid clubs, you can use them with your head held high any day of the week.